Marion, Iowa May 14 The Cary Club met with Mrs. E.J. Mentzer with thirteen members ansering to roll call. 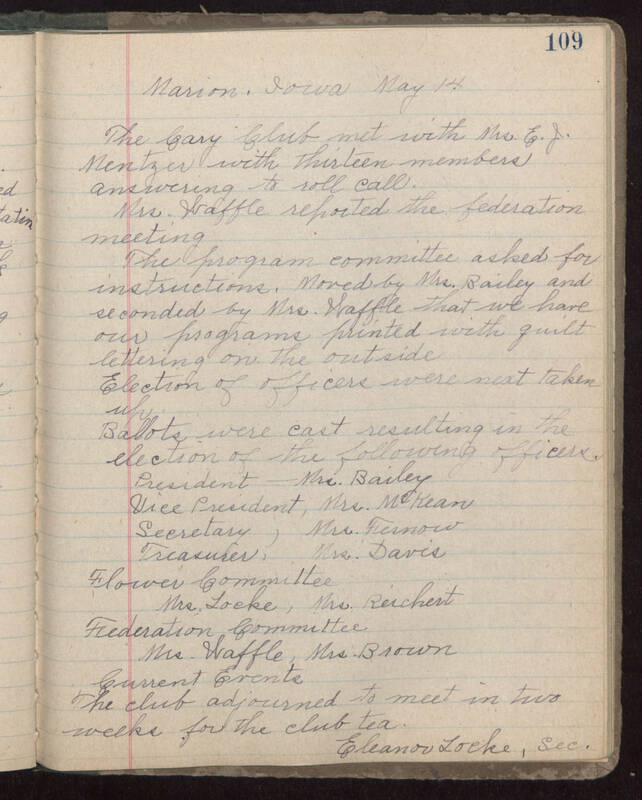 Mrs. Wapple reported the federation meeting. The program committee asked for instructions, moved by Mrs. Bailey and seconded by Mrs. Wapple that we have our programs printed with quilt lettering on the outside. Election of officers were next taken up. Ballots were cast resulting in the election of the following officers. President - Mrs. Bailey Vice President, Mrs. McKean Secretary, Mrs. Fernow Treasurer, Mrs. Davis Flower Committee, Mrs. Locke, Mrs. Reichert Federation Commitee, Mrs. Wapple, Mrs. Brown Current Events: the club adjurned to meet in two weeks for the club tea. Eleanor Locke, sec.